Houston's | Bentel & Bentel Architects/Planners A.I.A. HOUSTONS, BOSTON, MA - For this restaurant we had the opportunity to work in an urban location with a building fabric of both new and old structures some dating to the earliest periods of the city . Our project incorporates a significant new external structure located at an important point of contact between a building fabric of old buildings with emphatic historic associations and contemporary structures. The nearby Quincy Market and Fanueil Hall are connected in the minds of the public with the city of Boston and in particular it’s colonial past. They are also allied with the adjacent Boston City Hall in the history of urban renewal and revitalization that saw the reinvention of this area as a tourist destination. Though the historical narratives that bind these buildings and this area to the tourist industry may be little more than marketing fabrications, the vigor, scale and material character are striking. We took our cues materially from the buildings around such as Alexander Parris’ Quincy Market. The bronze enclosure of the restaurant provides the same emphasis of yellow metal which one sees on the Market’s dome and on numerous cupolas and domes in the area. No less impressive are the simple granite piers framing store fronts. We embraced the formal simplicity and material hardness. The simple form of the bronze “proscenium” of our design brackets the glazed opening in a manner not dissimilar from the trabeated wall of the market place and the glass openings of the City Hall Stone. Brick, concrete and yellow metals merge to form a “hard” outside consistent with the urban fabric around us. On its interior, wood, fabric, leather, oiled stone and richly colored artwork offer a striking contrast to the urban exterior. 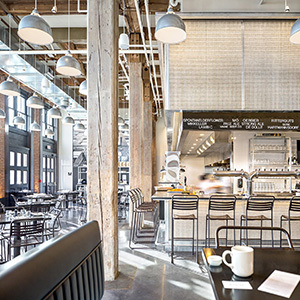 Conceived as an open restaurant, the kitchen is unshielded from the patrons either visually or environmentally. This visual center of activity lies at the heart of the seating platforms around it. Like two hands cupped to form an enclosure, the walls of this space wrap and isolate the community of patrons within.